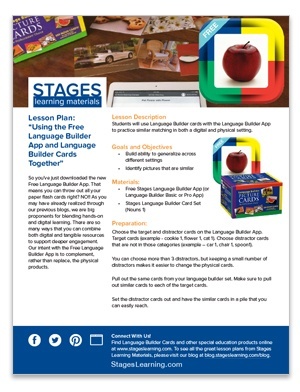 So you've just downloaded the new Free Language Builder App. That means you can throw out all your paper flash cards right? NO!! As you may have already realized through our previous blogs, we are big proponents for blending hands-on and digital learning. There are so many ways that you can combine both digital and tangible resources to support deeper engagement. 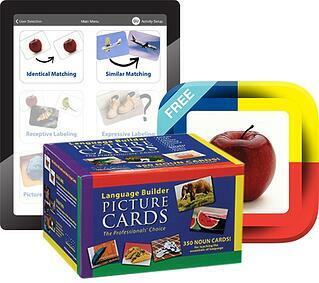 Our intent with the Free Language Builder App is to complement, rather than replace, the physical products. The student will demonstrate his/her similar matching skills using pictures of familiar objects. You can choose more than 3 distractors, but keeping a small number of distractors makes it easier to change the physical cards. With the app and the physical cards set up, open up the "Similar Matching" activity on the iPad. Go through the "Similar Matching" activity once with the student without the physical cards. Record results on your Free Similar Object Matching 3 Data Sheet. This activity can be made simpler or more difficult by adding in more distractors. The app is limited to 5 distractor cards on the screen, but you can add more physical distractor cards. You can also add position changes to the app and the physical cards for an additional level of difficulty.